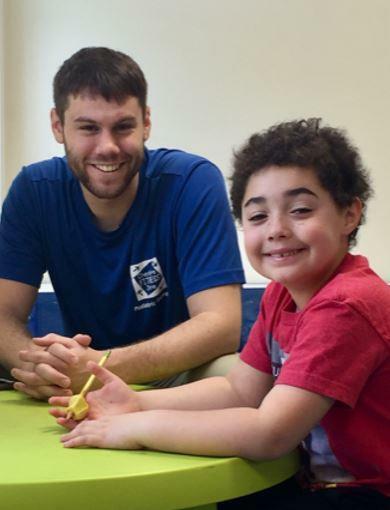 Cheshire Fitness Zone (CFZ) is dedicated to providing children and adolescents of all ages and abilities with therapeutic programs that help them to learn new skills they can use in life and grow in a supportive environment. Our 3 main therapy areas include: physical therapy (PT), occupational therapy (OT) and speech therapy (ST) options to meet the specific needs of all families that walk through our doors. We also take pride in employing a professional staff with many years of experience working with children and who find joy in the smiles of every child and family we treat. In our new Employee Spotlight series, you’ll meet some of these people and get to know more about their experience and what drives their passion. For our first spotlight, we’re talking to occupational therapist Cory Robertson. Cory has been with Cheshire Fitness Zone for four and half years and studied at Towson University in Maryland prior to joining the team. Can you describe what a typical day working at Cheshire Fitness Zone is like? Working at the Cheshire Fitness Zone is both enjoyable and unpredictable. We have an amazing staff that creates a positive working environment. Our schedules are almost always busy with either treatment sessions or paperwork. When I was in high school, each student had to complete volunteer hours. My mother’s friend was the director of preschool special needs program. I had the opportunity to shadow a co-treat between an occupational therapist, physical therapist, and speech and language pathologist in a sensory room. The combination of the environment and treatments made me extremely interested in pediatric occupational therapy. Since I started at Cheshire Fitness Zone, I have enjoyed working with children with attention deficit hyperactivity disorder (ADHD) and autism spectrum disorder (ASD). This has become an area that I have specialized in. I enjoy facilitating children’s skill development, while also having the opportunity to provide extensive education to families. I have learned that most families have a lot of questions when it comes to ADHD and ASD. I value being a resource for them, both during and outside of sessions. I have a few personal goals that I would like to achieve within the next 10 years. I would like to become a manager or be the head of a clinic. I would also like to create a multi-disciplinary program that can support children and families with ADHD and ASD. What are 3 words to best describe you? Stay tuned for more Employee Spotlights to get to know the staff from Cheshire Fitness Zone. If you’re interested in learning more about the services we offer and how we may be able to assist you, request an appointment using our simple online form.